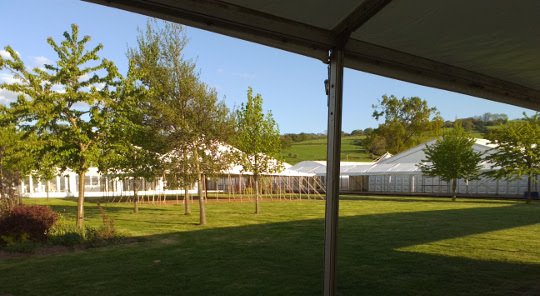 ABC Marquees have been providing marquee hire for the Wales Hay Festival since 2010. Called “The Woodstock of the mind” by Bill Clinton, the Hay Festival is now in its 29th year and will be held from 26th May until 5th June in the usual beautiful setting of Brecon Beacons National Park, on the Welsh border. This cultural event for families and children of all ages will hire five marquees from us this year, on a similar format to 2015. The largest marquee will be 9m x 24m with white PVC roofing, integral flooring and walls plus internal full height canvas divisions to create a corridor and four workshop units of between 6m x 3m and 6m x 12m. There will be a second large marquee of 9m x 18m, also with white PVC roofing, flooring and walls plus divisions to create a corridor and six workshop units of 3m x 3m each. Attached to these big marquees will be three further structures of 3m x 3m or 6m x 3m with PVC roofing, ensuring protection from the elements should the weather be inclement. The pictures featured above are actually from the 2015 festival which benefited from glorious sunshine; we hope they are as lucky with the weather this year!